Water is a colorless, odorless, tasteless and nearly transparent chemical compound that is one of the most common substances on Earth. 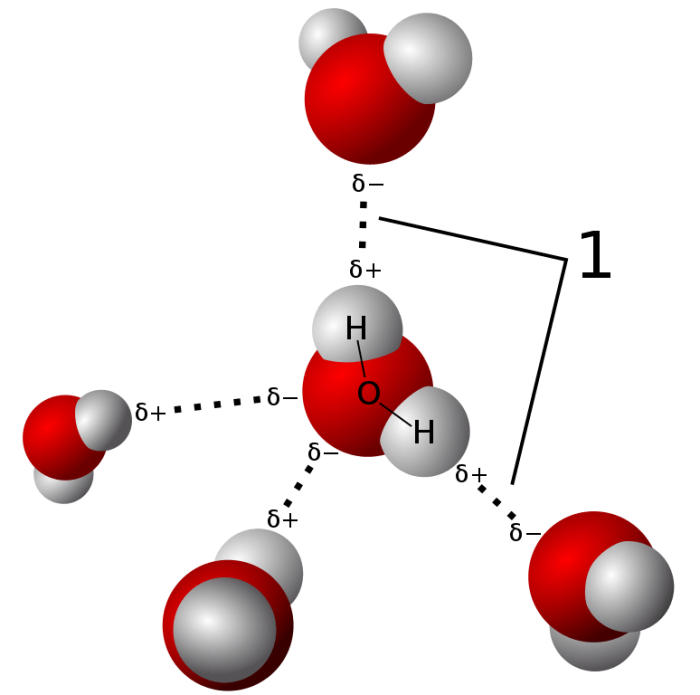 A single molecule of water has the chemical formula H2O, meaning that it is composed out of two hydrogen (H) atoms and a single oxygen (O) atom. 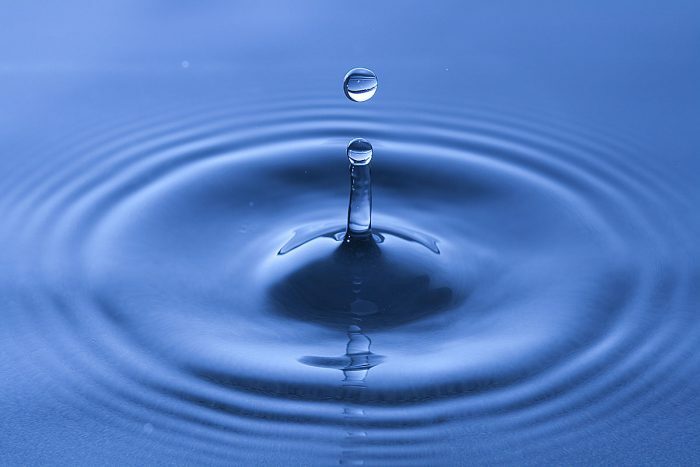 Water is a unique substance, in that its molecular structure endows it with a number of interesting properties not possessed by other chemical compounds. 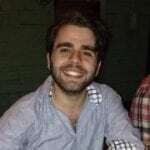 Among water’s unique properties are its solvent capabilities, high boiling and evaporating points, high specific heat capacity, incompressibility, and multi-phasic nature. Water is probably the single most studied and well-understood compound in human history so its properties have been known for a long time. In fact, the ancient Greek naturalist Thales thought that the universe fundamentally is water and that everything that exists is just some modification of water. It is the only substance that is commonly found in nature in the three states of matter, and water’s solvent capabilities are necessary for life as we know it. Over 60% of the human body is composed of water and over 70% of the Earth’s surface is covered in water. Water also serves as a standard-bearer for various units of measurement. For example, the Kelvin temperature scale is based on the triple point of water, which is defined as exactly 273.16°K. Water is a polar compound, meaning that it has an electric dipole moment. Because the oxygen atom is much more electronegative than the hydrogen atoms, the oxygen atom exerts a greater pull on the shared electrons This unequal force causes the electrons to tend more towards the oxygen atom than the hydrogen atoms. The result is that a water molecule has a partial negative charge localized on the oxygen end of the molecule and two partial positive charges localized on the hydrogen ends. The polarity of water molecules explains water’s solvent properties. When another polar substance is immersed in water, the partially charged oxygen and hydrogen ends attract the partially charged ends of the molecules in the submerged substance. The water molecules strip away molecules of the immersed substance and dissolve it. Because water is a good solvent, it is often used to make aqueous acidic solutions. Water’s polarity allows it to engage in a special type of intermolecular bonding called hydrogen bonding. A hydrogen bond is an electrostatic bond that forms between a hydrogen atom in one molecule and an electronegative atom in another molecule. In a water molecule, oxygen has a partial negative charge. This partial negative charge will attract the positive hydrogen end of other water molecules. Because hydrogen is a very small atom, it can get extremely close to neighboring oxygen atoms. Electrostatic attraction scales with the square of the distance between two charged particles, so an extremely close hydrogen atom exerts a rather strong electrostatic pull on oxygen molecules in neighboring water molecules. Each water molecule is capable of forming 4 distinct hydrogen bonds with neighboring water molecules. The hydrogen bonds of water explain an interesting physical property of water. Most compounds contract when they freeze. Removing kinetic energy from a substance slow the motion of its constituent molecules, so they are less likely to overcome intermolecular bonds that hold the molecules close together. When water is cooled, it contracts like one would expect, until it reaches about 4 °C. At that point, water expands by about 9% its total volume. Water expands when it freezes due to its hydrogen bonds. When water is cooled, its constituent molecules slow down. The slower moving water molecules are more susceptible to forming hydrogen bonds with other water molecules. The unique character of hydrogen bonds arranges the molecules in a rigid tetrahedral lattice-like structure. This is why ice floats on liquid water; since water expands when it freezes, a sample of ice is less dense than a sample of liquid water with equal mass. 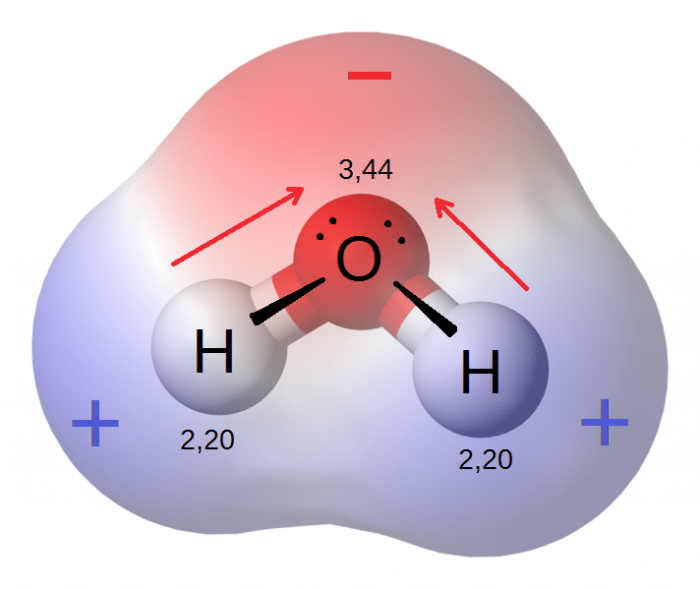 Water’s hydrogen bonds explain a number of it thermodynamic properties as well. Compared to other compounds with a similar molecular structure, water has an unnaturally high boiling point. In order to boil a substance, one has to add kinetic energy to a substance so that its constituent molecules can overcome any intermolecular bonds. Because of its strong hydrogen bonds, it requires relatively more energy to make the motion of water molecules overcome their intermolecular bonds. Likewise, and for the same reason, water has a very high specific heat capacity. The heat capacity of a substance is the amount of energy required to raise the temperature of a gram of a substance by one degree K. The specific heat capacity of water is about 4.2 J/g⋅K, so it requires 4.2 joules of energy to raise the temperature of 1 gram of pure water by one degree Kelvin. Compare this value to hydrogen sulfide (H2S), a compound that has a molecular structure like water. Hydrogen sulfide has a specific heat capacity of 1.0003 J/g⋅K. That is, it takes almost 4 times more energy to raise the temperature of 1 gram of water by a single degree than the amount it takes to raise the temperature of an equivalent mass of hydrogen sulfide by a single degree. Incidentally, the calorie as a unit of heat is defined as the amount of heat energy required to raise the temperature of a gram of pure water by 1 degree Celsius., As the Kelvin and Celsius temperature have units of equal magnitude, 1 calorie is equal to 4.2 joules. Additionally, hydrogen bonding gives water a high heat of fusion, heat of vaporization and thermal conductivity. The combination of these properties makes it so water is very efficient at transferring heat and regulating temperatures. This mechanism is most evident in Earths climate, where water stores heat and transports it between oceans and atmospheres. Water’s thermal properties also make it useful for industrial purposes. Steam engines and hydraulic technologies use the thermodynamic properties of water to generate mechanical energy. Water’s hydrogen bonding also gives it a relatively high surface tension. Molecules at the surface of a sample of water bond more tightly to adjacent water molecules than they do to the molecules in the surrounding atmosphere. The result is a thin “film” across the surface that can support weight. Several organisms like water striders and lizards exploit this high surface tension to walk on water. The same mechanism behind surface tension also explains water’s capillary action. Intermolecular attractions between molecules allow water to climb the walls of vertical tubes even in face of gravity. Several plants rely on this capillary action for water transport. Because hydrogen and oxygen have numerous isotopes, there exist several known isotopologues of water. Most different species of water are a result of different isotopes of hydrogen. For example, protium is an isotope of hydrogen that consists of one proton and no neutrons. Most naturally occurring water is formed with protium isotopes of hydrogen. In contrast, deuterium is a hydrogen isotope that consists of one proton and one neutron. Deuterium water occurs at a rate of about 15 parts per million. Deuterium water, sometimes called “heavy water,” is slightly more massive than protium water. This more mass translates into better thermal conductivity properties. As such, deuterium is often used in nuclear reactors as a neutron sink and coolant. 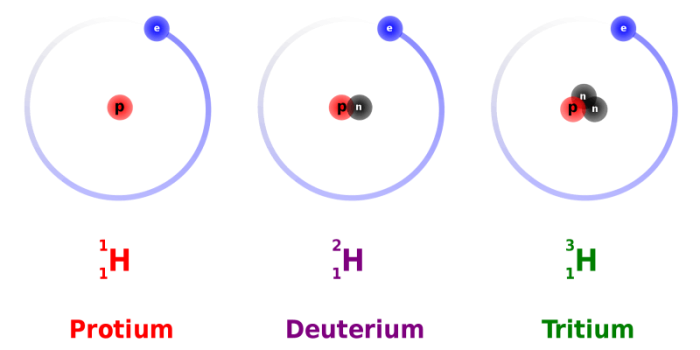 Human consumption of large quantities of deuterium can cause biological complications, in particular, nervous and kidney impairments. There also exists an isotopologue of water made out of hydrogen atoms that have 2 neutrons. “Tritium” water is more massive than both protium water and deuterium water. Tritium water is radioactive and decays with a half-life of about 4,500 days. Most naturally occurring tritium is formed in the upper atmosphere, where water vapor is bombarded by cosmic rays. Because water is ubiquitous and its properties are so well understood, it has historically been used to set standards for units of measurement. In fact, for a very long time, water was used to define the gram (g), the standard unit of mass. In 1795, one kilogram was defined as the mass of one cubic deciliter (a 10cm by 10cm by 10cm cube) of water. In 1900, the liter (L) was defined as the amount of volume of 1 kg of water at standard pressures and temperature. Additionally, both the Celsius and Kelvin temperature scales are based on the boiling point and triple point of water, respectively. 100 °C is defined as the boiling point of water at 1 atmosphere of pressure, and the triple point of water is defined as exactly 273.16 °K. Water has also been used to define standard pressure, as 1 atm of pressure is sometimes defined as the pressure required to life water 13.1 m up a vacuum column. Lastly, water has been used in thermodynamics to define standards of heat and thermal conductivity. The calorie (cal) has historically been defined as the amount of heat energy required to raise the temperature of one gram of water by 1 °C at standard temperatures and pressures.